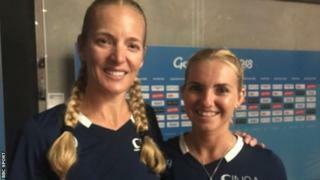 bbc.comOne of their hopes for the Commonwealth Games was to make a doubles match last for 20 minutes. But for the Cayman Islands' women's squash pairing of Eilidh Bridgeman and Caroline Laing, it was just not possible. With defeats in their three pool games lasting no more than 12 minutes - giving up 66 points and scoring 10 - it ruthlessly demonstrated the level they were up against on Australia's Gold Coast. They were drawn in Group B against the two English pairings of Laura Massaro and Sarah Jane Perry and Jenny Duncalf and Alison Waters plus the Scottish team of Lisa Aitken and Alison Thomson. After conceding the first 20 points of their final fixture against Duncalf and Waters without reply, they eventually won one point which prompted cheers from their own coach and timid smiles of their own. "I was really hoping we would get a point, either through a mistake or because we won a point just so we could relax," Laing said.It is brutal yet inspiring to witness. Bridgeman and Laing asked Duncalf and Waters for a photograph, they took defeat with dignity and had the courage to put themselves on a platform where they knew a drubbing was likely. For clarity, they are outstanding squash players and would stand out at most levels of the sport. Their reactions, agility and technique are clear to see. But it is difficult to compete with their full-time, professional opponents. Laing, 40, who is a lawyer on the Cayman Islands, said: "I moved to Cayman in 2005, played a fair bit but then I had three children so I haven't really played a lot in the five years I have been a mum until last summer when I started training for this. "Bridgeman, 24, has played for several years but started taking the sport more seriously after studying at university. "Everyone else here seems to have been playing since they can walk," says Bridgeman, who works for the Cayman Islands Olympic Committee. Together the pair put in two court sessions a week, two hours of team fitness work and then squeeze in whatever else they can. "It's one of those things where everyone feels a bit sorry for you and everyone wants the underdog to put up a fight," says Bridgeman. "The scoreline doesn't reflect some of the rallies we were having. "We don't have a doubles court on Cayman, they are bigger than a singles court, and that is a major thing. I think we have to fly to Philadelphia to get access to a doubles court." Needless to say, they don't make the 3,000-mile round trip to Philadelphia. They train in a squash facility rebuilt after Hurricane Ivan destroyed half of the western Caribbean island in 2004.So how does being thrown into the sweatbox with professionals feel[/IMG]"They hit the ball hard, their reactions are really good so it comes back quickly, they are more accurate and they pick up balls so things that work against people closer to our level don't work with them. "And these girls are super fit. They train maybe two to six hours a day and have been doing so for a long time." Laing and Bridgeman found out they would be partners just six weeks ago, which is a stark contrast to their professional rivals who can spend years honing their partnership.It is clear they are fiercely competitive, but moments after defeat they were still willing to conduct an interview. "I have to keep reminding myself that getting here was the goal," says Bridgeman, adding they have been received "like royalty" while staying in the athletes' village.Laing added: "If you didn't have the drive, motivation and competitive spirit, neither of us would be here. Because you have that, when you do get here you still do want to win. "But we knew we weren't going to. We wanted to enjoy it and feel we did ourselves proud. "Even being asked to speak to the BBC, we are really chuffed."